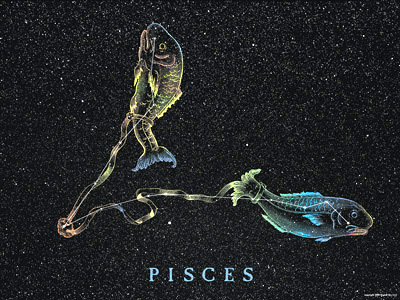 Item number DS412 - Pisces - Image © Digital Sky LLC. Pisces is a large fall constellation of mostly faint stars. It is usually seen as one or two fish. One Greek story says the fish are Venus and her son Cupid. They jumped into the river to escape the fire breathing monster Typhon. They turned themselves into fish and swam away.